Worthing Borough Council and particularly Worthing Theatres were delighted to support this wonderful exhibition that celebrates Jane Austen's links with the town. Beautifully presented and very popular we hope this is just the beginning. "The exhibition is of such a high standard, being elegant, informative and fun. It should be a PERMANENT attraction in Worthing"
"An amazing experience - so welcoming and inspiring"
"I really liked the workshops and learnt a lot about Jane Austen. Amazing!" "CONGRATULATIONS! A truly wonderful occasion, recreating the atmosphere of Jane Austen's Worthing. Musicians and soloist were brilliant. I loved dancing my first minuet! More PLEASE! " "Brilliant exhibition, thank you! " "Fantastic exhibition. Wonderful to see buzz around town"
"Well researched and informative and friendly engaging staff"
Welcome to our new online archive of this special event held at the Chatsworth Hotel in Worthing, 23 May - 7 June 2015. On the EXHIBITION page you will find a complete set of the display boards from the exhibition, plus links to work created by our artists in residence. A summary of the complete event is HERE. There are many IMAGES from the exhibition and the associated events; photos and links to videos. 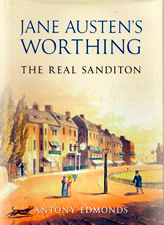 "Jane Austen's Worthing : The Real Sanditon"
See the THANK-YOUS page for the many people and organisations we have to thank for making the event a sucess. Also details on how to buy this fascinating book. Worthing is waiting for you to visit. Come and explore the history of our wonderful town. See the VISIT US page for lots of ideas.